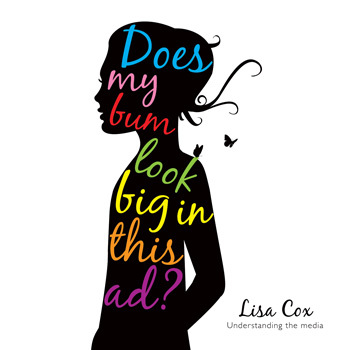 Kids' Book Review: Review: Does My Bum Look Big In This Ad? Review: Does My Bum Look Big In This Ad? Title: Does My Bum Look Big In This Ad? About: They’re all around us: images of perfect bodies, flawless complexions, impossibly skinny waists. Ads claiming we too could look that way if we just use this particular product. People telling us we don’t look the way we should, niggles of self-doubt fed by negative peers or family members. This book gets to the bottom of it all. Aimed at teenagers looking for an easy-to-read way to educate themselves about body image issues, the messages are handled extremely well. With a look at the media, how women and men are portrayed, behind-the-scenes glimpses into photo shoots and how advertisements are created, it is full of information without being overloaded or complicated. I’ll get my criticism out of the way first. The book claims to “have not been dumbed down for youth” and, for the most part, that is correct. But by beginning with a foreword specifically for parents and educators before moving to the sections for teenagers, with very different language, readers may be wary. Perhaps the ‘adult’s’ section should have been placed at the back, or even excluded as everything covered there is spoken about throughout the book. Look beyond this and you’ll find a positive, helpful book full of well-researched tips. A reference and educational tool for teenagers, the strength of this book is its focus on the ‘how’ rather than just they ‘what’ and ‘why’. For example, in the section about who is to blame for negative body image, a number of sources are listed: technology, media, peers, and so on. The bottom line, though, is that every individual must take control of their own thoughts and actions. Each section is concluded with an activity requiring research and discussion to really help readers understand body image issues in their own environment. This is a vital part of the book; a fantastic resource for educating oneself about the media and taking control of your own life. Knowledge is power and this book is a great tool for teenagers (girls and boys) in their search for certainty and positivity.